T-7 Zephyr tamper-resistant Torx insert bit, 1/4'' hex shank, 1'' overall length. Equivalent to Apex 440-TX-07-H.
T-8 Zephyr tamper-resistant Torx insert bit, 1/4'' hex shank, 1'' overall length. Equivalent to Apex 440-TX-08-H.
T-9 Zephyr tamper-resistant Torx insert bit, 1/4'' hex shank, 1'' overall length. Equivalent to Apex 440-TX-09-H.
T-10 Zephyr tamper-resistant Torx insert bit, 1/4'' hex shank, 1'' overall length. Equivalent to Apex 440-TX-10-H.
T-15 Zephyr tamper-resistant Torx insert bit, 1/4'' hex shank, 1'' overall length. Equivalent to Apex 440-TX-15-H.
T-20 Zephyr tamper-resistant Torx insert bit, 1/4'' hex shank, 1'' overall length. Equivalent to Apex 440-TX-20-H.
T-25 Zephyr tamper-resistant Torx insert bit, 1/4'' hex shank, 1'' overall length. Equivalent to Apex 440-TX-25-H.
T-27 Zephyr tamper-resistant Torx insert bit, 1/4'' hex shank, 1'' overall length. 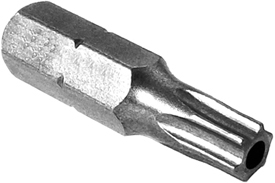 Equivalent to Apex 440-TX-27-H.
T-30 Zephyr tamper-resistant Torx insert bit, 1/4'' hex shank, 1'' overall length. Equivalent to Apex 440-TX-30-H.
T-45 Zephyr tamper-resistant Torx insert bit, 5/16'' hex shank, 1 1/4'' overall length. Equivalent to Apex 480-TX-45-H.
T-50 Zephyr tamper-resistant Torx insert bit, 5/16'' hex shank, 1 1/4'' overall length. Equivalent to Apex 480-TX-50-H.
T-55 Zephyr tamper-resistant Torx insert bit, 5/16'' hex shank, 1 1/4'' overall length. Equivalent to Apex 480-TX-55-H. The Z0T40TX T-40 Zephyr 1/4'' Torx Insert Bits, Tamper Resistant is one of thousands of quality tooling products available from MRO Tools. Please browse Zephyr Torx Insert Bits for tools similar to the Z0T40TX T-40 Zephyr 1/4'' Torx Insert Bits, Tamper Resistant. Z0T40TX T-40 Zephyr 1/4'' Torx Insert Bits, Tamper Resistant description summary: T-40 Zephyr tamper-resistant Torx insert bit, 1/4'' hex shank, 1'' overall length. Equivalent to Apex 440-TX-40-H. Quantity discounts may be available for the Z0T40TX T-40 Zephyr 1/4'' Torx Insert Bits, Tamper Resistant. Please contact MRO Tools for details.